Habit: Perennial herb [annual], hairy, generally glandular; rhizome slender or 0. Stem: decumbent to erect, 0.1--2.5 m. Leaf: 1.5--18 cm, proximal generally petioled, distal +- sessile; blade oblong to ovate, serrate to crenate. Inflorescence: spike-like, generally terminal, interrupted or continuous, bracted. Flower: calyx bell-shaped, +- radial, veins 5--10, lobes 5, erect or spreading, triangular, tips sharp; corolla white, yellow, pink, red, magenta, or purple, tube narrow, with internal ring of hairs generally above base, perpendicular to oblique to tube axis, generally with short, pouched spur on the lower side of the tube, upper lip erect or generally parallel to tube axis, concave, entire (notched), generally hairy, lower lip perpendicular to tube axis or reflexed, 3(2)-lobed, glabrous to hairy. Fruit: oblong to ovoid, brown to black, smooth or irregularly, minutely roughened. Species In Genus: +- 300 species: generally temperate; some cultivated for ornamental or edible rhizomatous tubers. Etymology: (Greek: ear of corn, from inflorescence) Note: Stachys arvensis L., Stachys floridana Shuttlew. historical waifs. Stem: erect, 1--2.5 m, simple to branched distally, stiff-hairy, glandular. Leaf: petiole < 8 cm; blade 6--18 cm, deltoid to ovate, soft-hairy, densely glandular abaxially, margins generally straight, crenate, base cordate, tip acute. Inflorescence: 10--40 cm, interrupted; clusters 2--6-flowered. Flower: calyx tube 7--12 mm, soft-hairy, glandular, lobes 3.5--4.5 mm; corolla deep magenta to purple, tube 18--24 mm, ring of hairs > 2 mm from base, perpendicular to +- oblique, upper lip 6--10 mm, reflexed in age, lower lip 8.5--15 mm. Chromosomes: 2n=64. Unabridged Synonyms: Stachys flaccida Eastw. Unabridged Note: Stachys cooleyae A. Heller [Stachys chamissonis var. cooleyae (Heller) G.A. Mulligan & D.B. Munro] not in California. 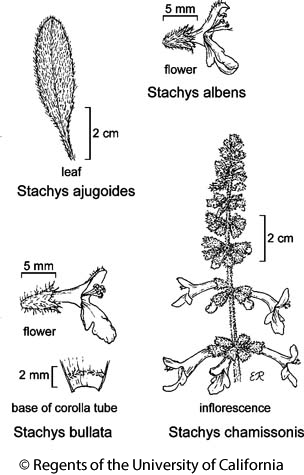 Citation for this treatment: John B. Nelson 2012, Stachys chamissonis, in Jepson Flora Project (eds.) Jepson eFlora, http://ucjeps.berkeley.edu/eflora/eflora_display.php?tid=45346, accessed on April 26, 2019. No expert verified images found for Stachys chamissonis. NCo, CCo, SCoR. Markers link to CCH specimen records. Yellow markers indicate records that may provide evidence for eFlora range revision or may have georeferencing or identification issues. Purple markers indicate specimens collected from a garden, greenhouse, or other non-wild location.